The AANN Comprehensive Review for Stroke Nursing e-book is a comprehensive resource for nurses preparing for the Stroke Certified Registered Nurse (SCRN) exam and those looking for a review of current best practices for providing stroke care. This evidence-based book covers key topics listed on the SCRN exam blueprint, including anatomy and physiology, preventive care, hyperacute care, stroke diagnostics, acute care, medications, postacute care, and systems and quality care. The AANN Comprehensive Review for Stroke Nursing is also available in print format. Or, save money by purchasing the print and e-book bundle. Using the online Learning Management System (LMS), you can quickly download this e-book and carry it with you for point-of-care reference. This PDF is fully searchable, with several linked references, bookmark feature, table of contents and click-and-zoom tables and figures. 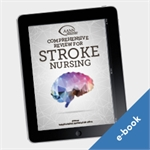 Please note: The Comprehensive Review for Stroke Nursing e-book is available in PDF only. "The chapters on hyperacute care and systems and quality attracted my eye as innovative. Hyperacute care here is referring to the emergency recognition and triage of possible stroke patients and their emergency interventions. The tables make for a quick reference at the bedside." Unable to access ebook. Still awaiting response to problem accessing it. Maybe hire an IT team? Very bothersome after spending good money for it.